Csaba Vojko - kovácsolt kések kézi tengelyek Miskolcon, Magyarország. Нож-пистолет-топор. Фото. Видео. Опыт работы с 1987 года. 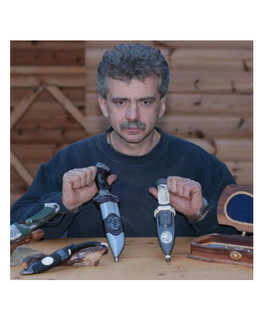 Владеет венгерскими и английским языками. Я профессиональный ножедел. Я лично придумываю, кую и гравирую свои работы. Весь процесс при изготовлении своих работ, я выполняю сам, за исключением специальной и очень сложной гравировки. Мне нравится сочетать различные типы оружия, такие как пистолет-нож, топор-нож, топор-пистолет-нож и т.д. В основном я работаю с дамасском из углеродистой стали, а также использую редкие породы дрвесены (Эбен, зебрано, ореховое дерево). 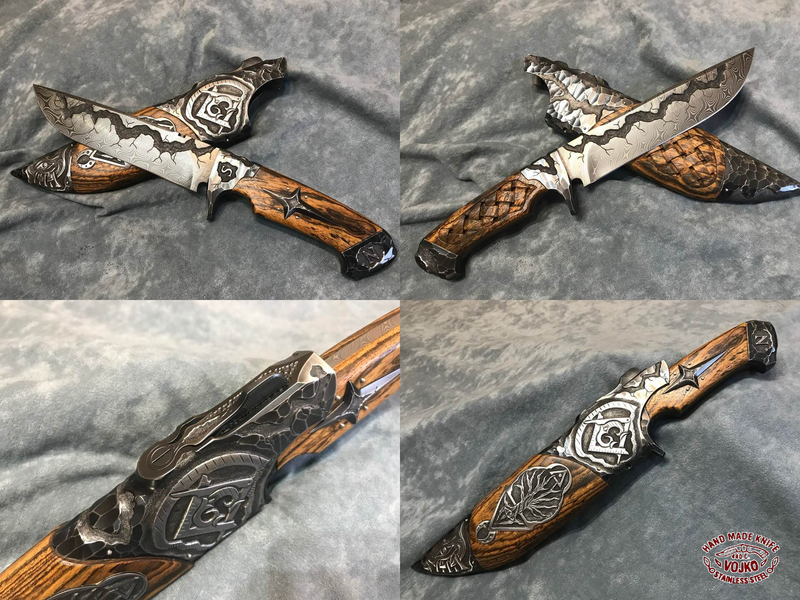 И такие материалы как бивень мамонта, рога и т.д. Стоимость моих работ начинается от 500$. 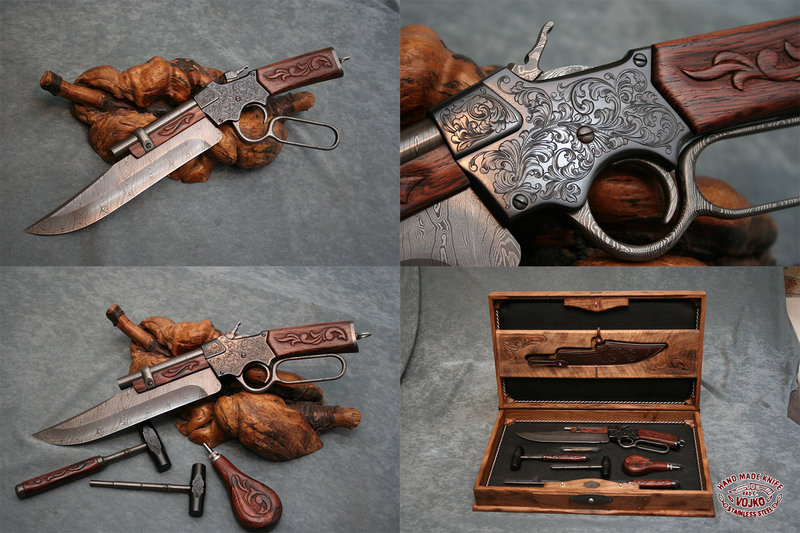 0.22 Caliber, Double-Barrel Pistol-Knife (black powder). 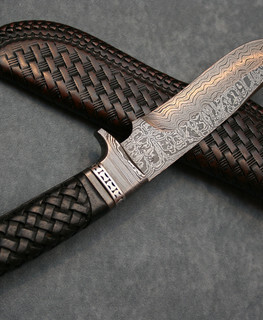 The blade is made from Strand Damascus Carbon Steel (K-720, L6). 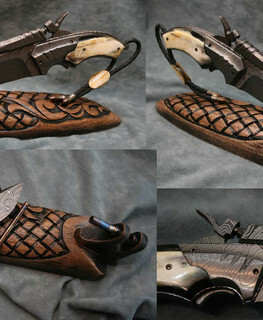 The grip is carved from Eben wood. 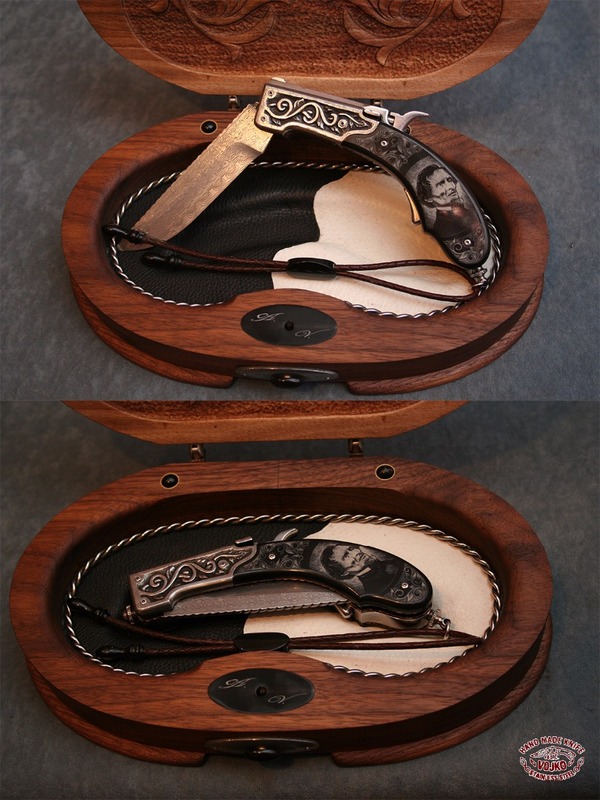 The box is carved from American Walnut Wood. 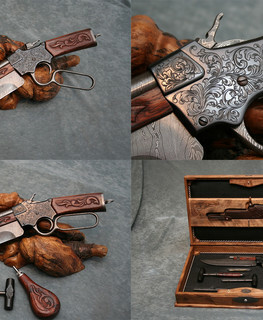 Derringer Pistol-knife (0.22 Caliber , black powder). 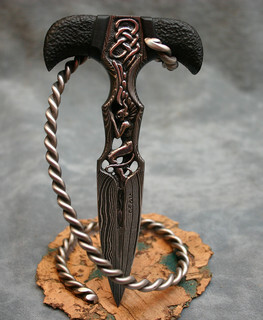 All metal parts are made from (K-720. 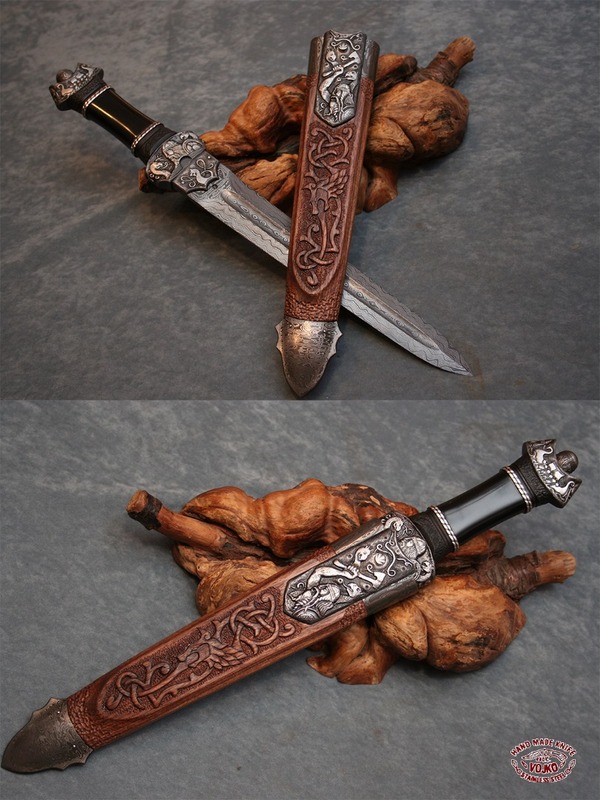 L6) Damascus Carbon Steel. 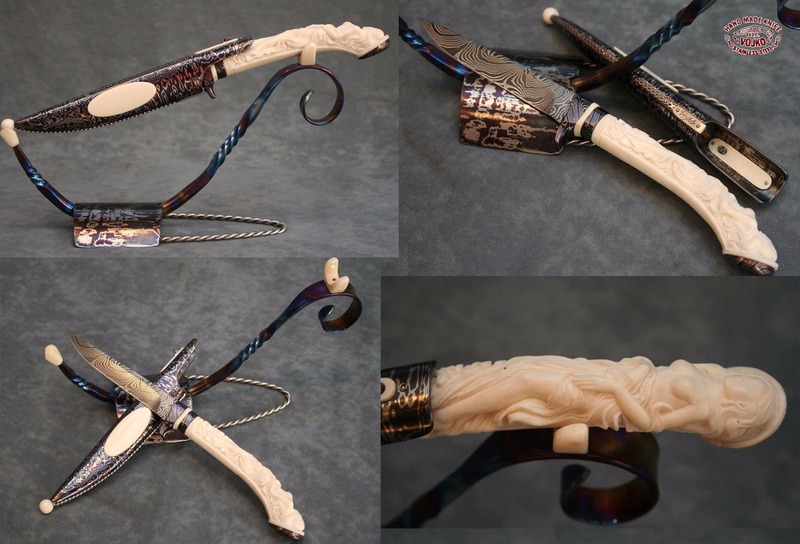 The handle and decorations are made from Indian Water Buffalo horn. 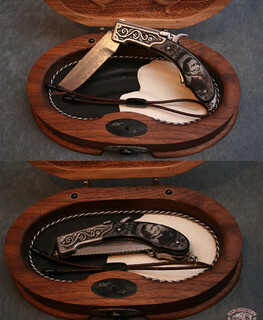 The box is made from Padock wood, size is 8.6-5.5 Inch (220-140 mm). 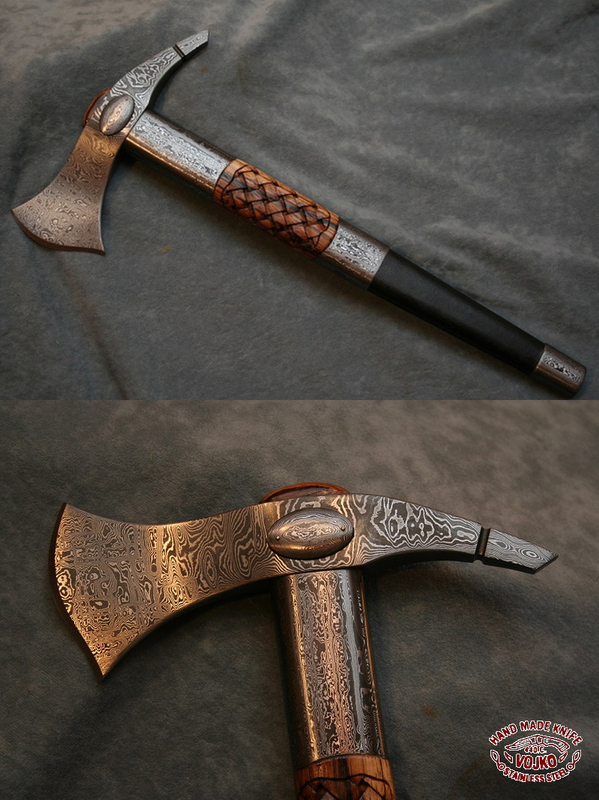 COMBO-AXE WITH A BUILD-IN GUN, AND A HIDDEN KNIFE IN THE HANDLE GRIP. 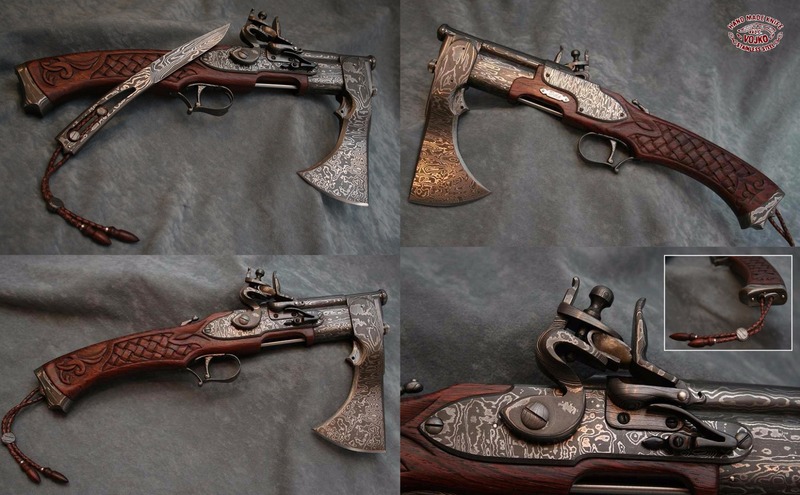 Combo-Axe :the gun is 0.22 Caliber (Front loading, flint gun, black powder). All metal parts are made from (K720. 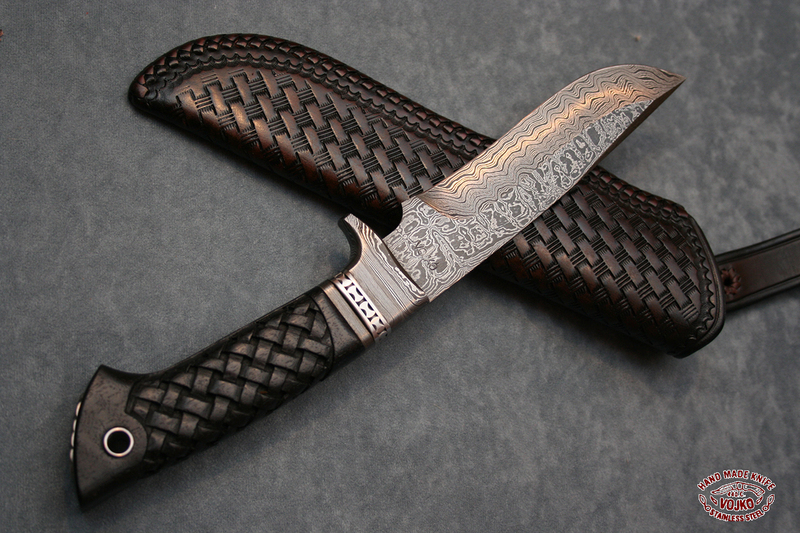 L6) Damascus Carbon Steel. 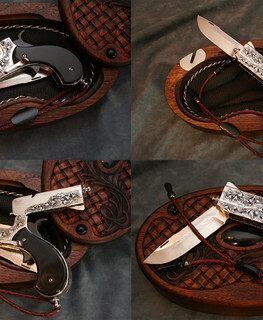 The handle is carved from Honduras Rosewood. 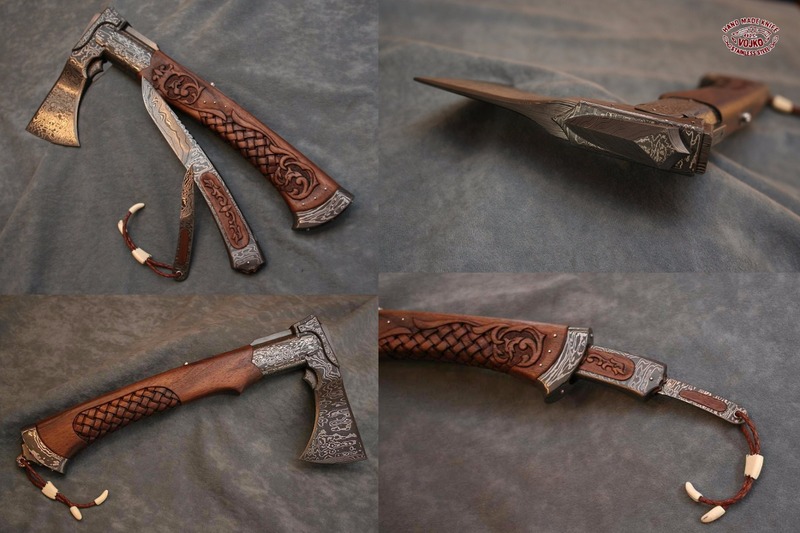 AXE WITH DOUBLE KNIVES - 2 KNIVES HIDDEN IN THE HANDLE! 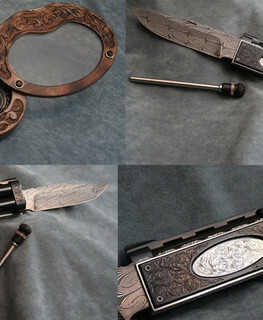 All metal parts are made from (K720. 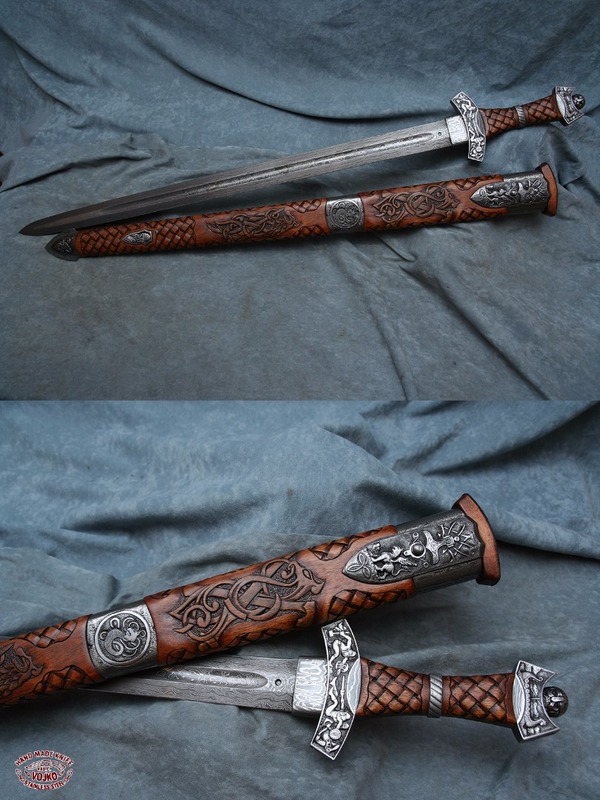 L6) 144 layered Damascus Carbon Steel. 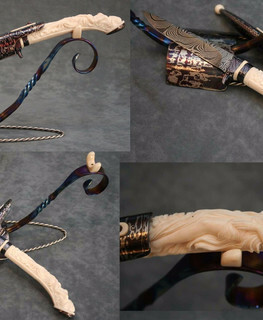 The handle is carved from American wood. 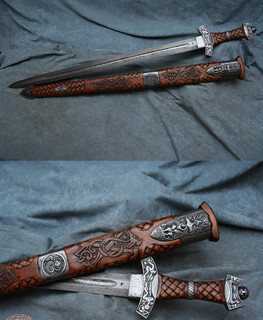 Sword's all metal parts are made from (K720. 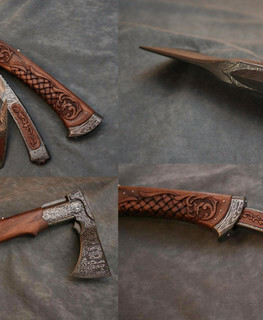 L6) 144 layered Damascus Carbon Steel. 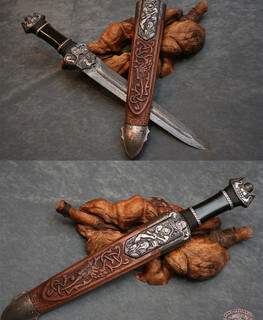 The handle , and sword sheath wood parts is carved from Walnut wood. 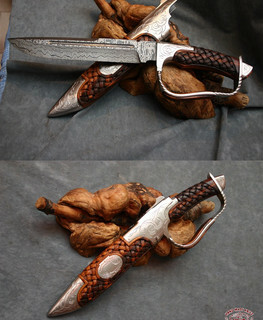 Length is : 14.56" (370 mm),. 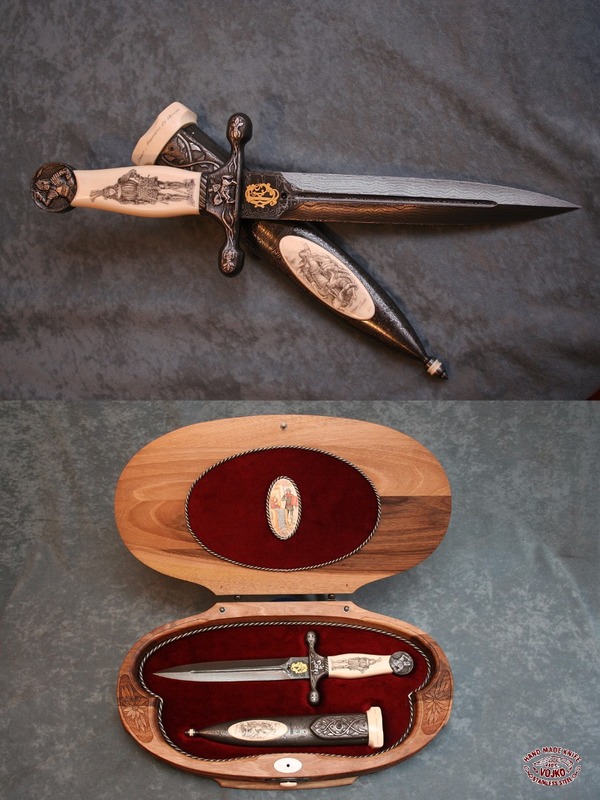 Width is: 7.28" (185 mm). 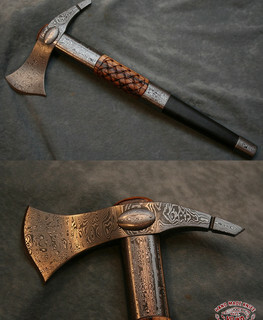 The Tomahawk head and it`s fitting made from 204 layered sheet Damascus Carbon Steel. 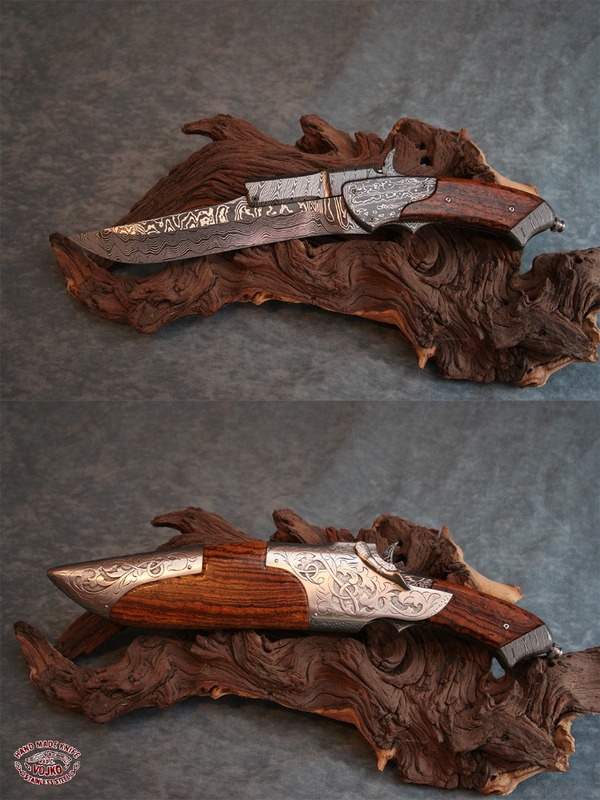 Damascus knife: the handle and the bone decorations are carved from Mammoth tusk . 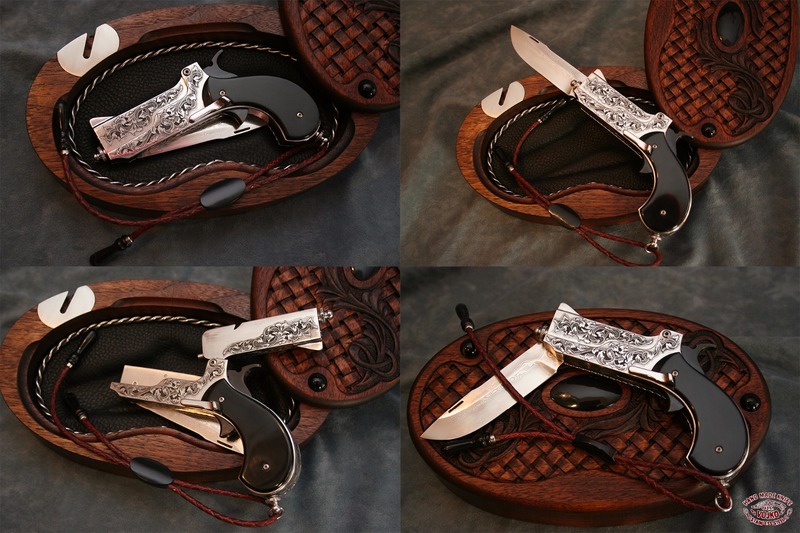 Sheath is layered Damascus Carbon Steel (pure Nickel and C-60). 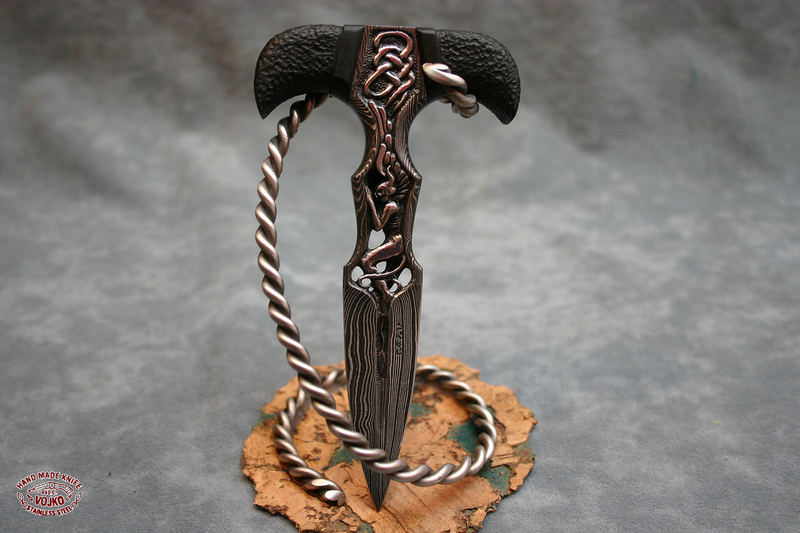 The knife stand is made from Titanium. 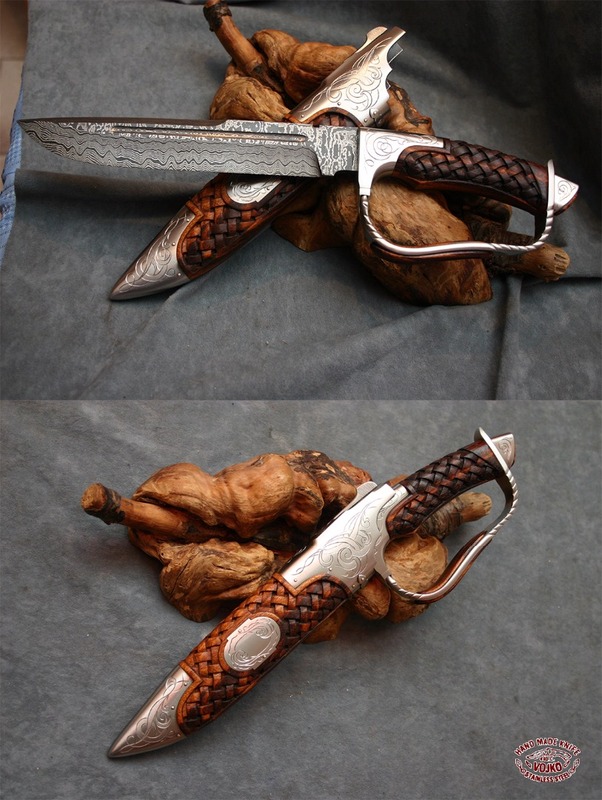 The dagger and the sheath are layered Damascus Carbon Steel . 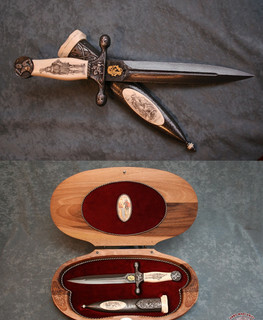 The box is carved from Walnut wood. 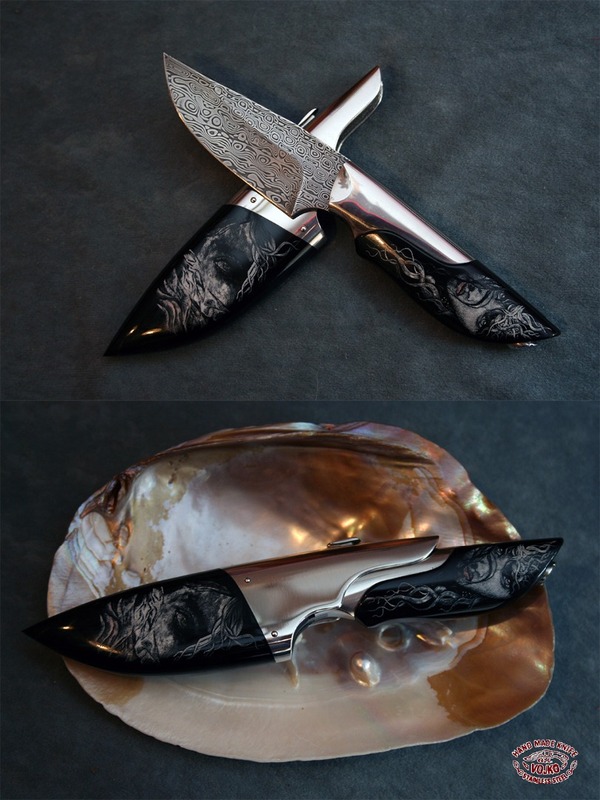 Pistol-Knife (0.22 Caliber , black powder). 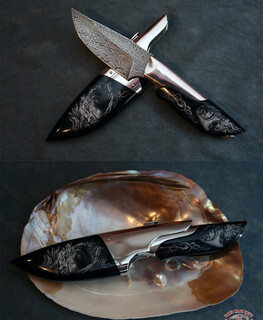 The handle is made from Buffalo horn. 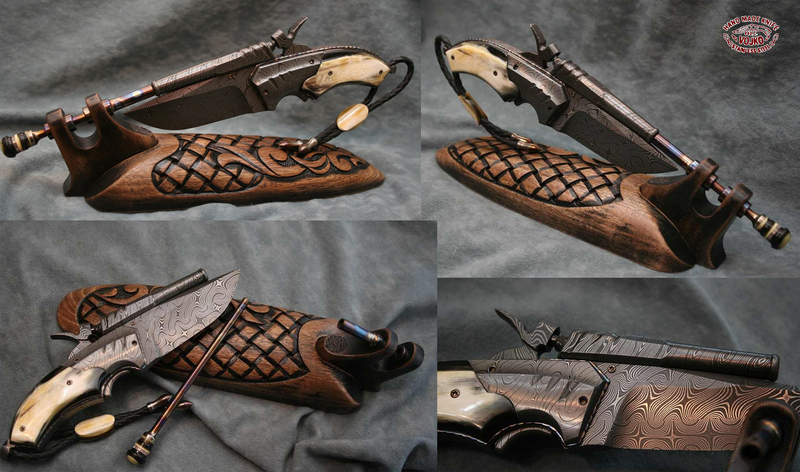 The pistol stand carved from Walnut wood. 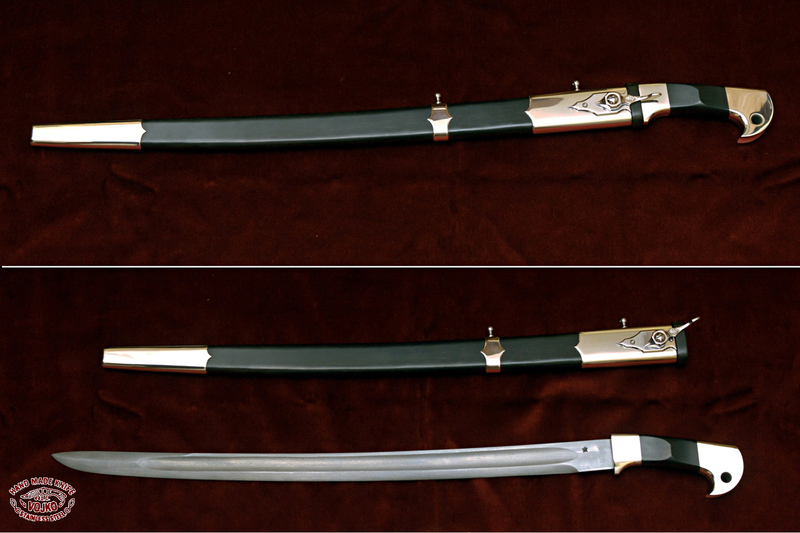 Total length is 170 mm. 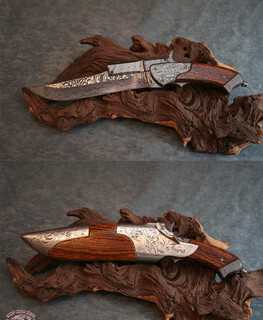 Hunting blade made from layered damascus carbon steel. 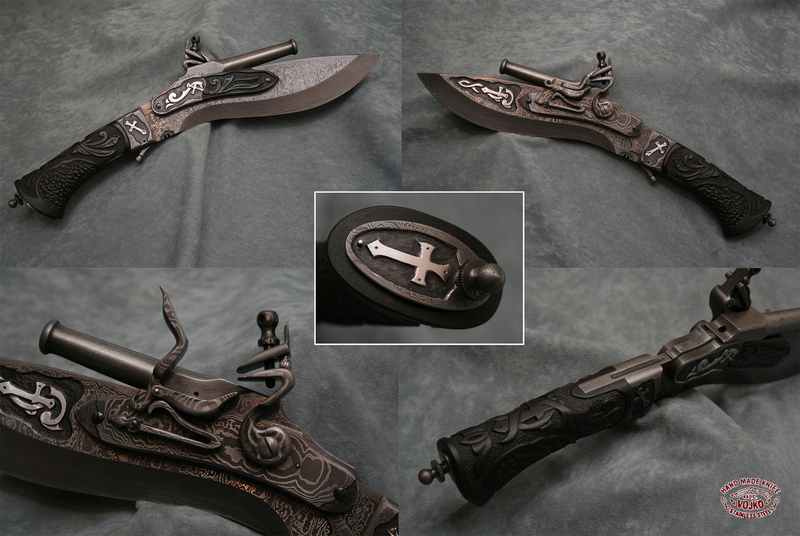 The handle grip carved from black Eben wood. 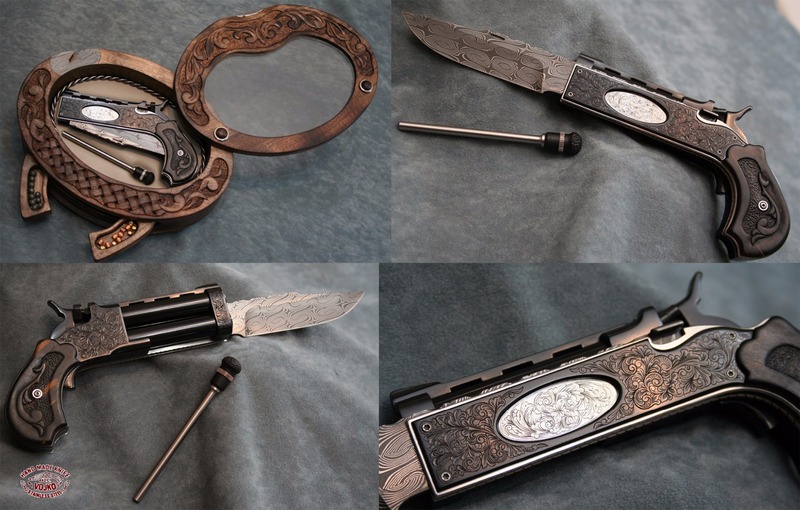 The blade , and the pistol's all metal parts are made from Twisted Turkish Style Damascus Carbon Steel (K-720, L6). 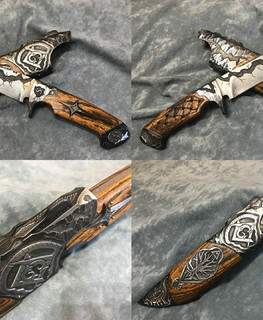 The grip is carved from Honduras Rose Wood. 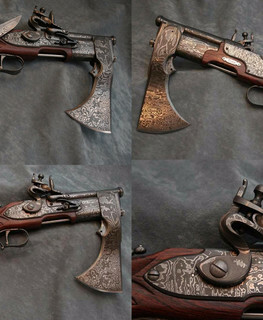 With Muzzle loaded flintlock pistol. 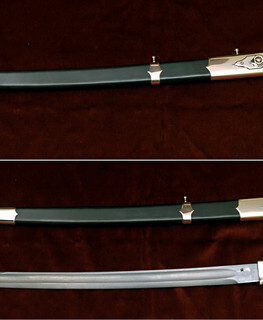 width 4.3 Inch (110 mm). 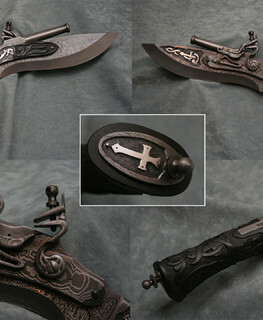 The grip is carved from Black Ebony Wood.